August | 2016 | First Nations Film and Video Festival, Inc.
Laura Guzman (Stockbridge Munsee/Mexican); Photo property of FNFVF Inc.
CHICAGO, IL) The Call for Entries is now open for First Nations Film and Video Festival Inc’s fall festival set to take place November 1st through the 10th, at venues across the Chicagoland area. The deadline for entries is September 15, 2016. “We have seen a great number of entries in the past two festivals thanks to moving to an online platform,” says Ernest M Whiteman III, Director of FNFVF Inc. “The quality and variety of films seems to have increased as well and we are proud to showcase the little seen films right here in Chicago. The First Nations Film and Video Festival has been screening Native-produced film in CHicago since 1990 and the outreach has never stopped. FNFVF Inc has several educational program they offer, usually free of charge, organizations, schools, and colleges. 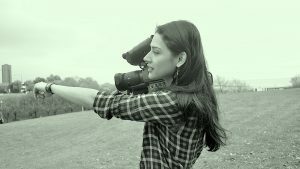 They offer “The Other 51%: Native American Women Directors” and educational screening on Native Americans Cinema that can tailored to fit any classroom or event. Contact the film festival for information on these programs. The guidelines for the FNFVF are as follows; open to Native directors only, and films of any genre or length are accepted if produced within the last five years. For more information and to access their festival application, visit the APPLICATION PAGE. You can access the online application at Film Freeway. First Nations Film and Video Festival Inc is a 501c3, non-profit organization. In an effort to raise funds for our two annual festivals, and for paying venue fees, screening fees, and to put funds towards bringing in Native directors, FNFVF Inc has launched several Tee Spring Campaigns to help raise funds for these endeavors. We ask you to browse and help the First Nations Film and Video Festival as it readies for its upcoming Fall FNFVF taking place November 1 – 10, 2016 at various venues across Chicago. With your help, we can make the festival a bigger and better event for Native American Cinema. Follow the link above or click the picture to visit the FNFVF inc Storefront!